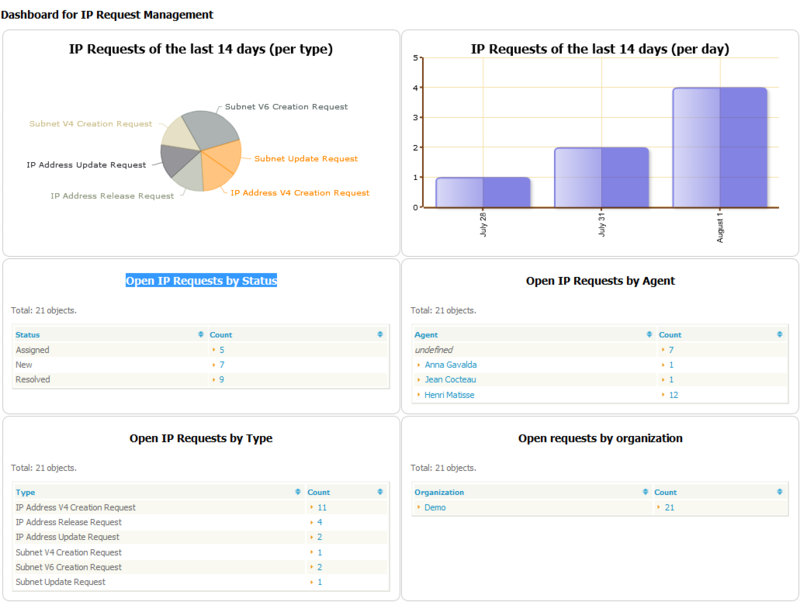 TeemIp's IP Request Management extension allows you to manage user requests that are specific to IP management: IP and subnet creations, modifications or deletions. This module is embedded by default in TeemIp standalone. It can be deployed as an extension with TeemIp as a module. At any time of the life of the ticket, the support agent can communicate with the customer via a “Public log.” He can also communicate with teams internal to his company through a “Private log”. 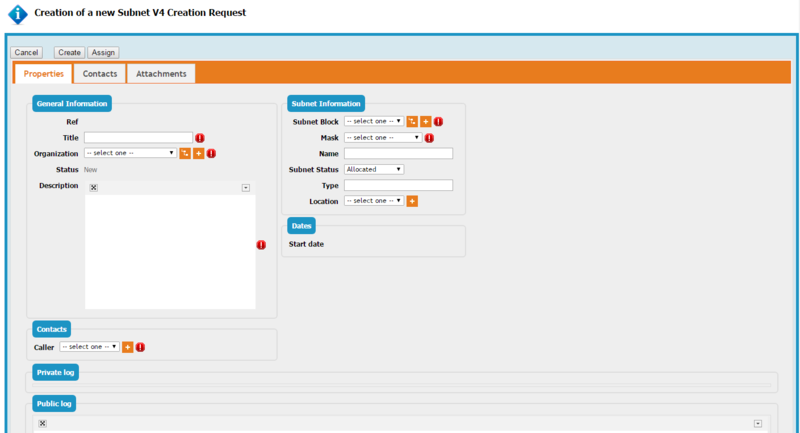 When used within TeemIp standalone, users can benefit from the embedded TeemIp portal to log requests and manage them. In such case, communication between the caller and the Hostmaster team is done through that portal, through the public logs of the tickets. Users only see the public logs, of course. The private log cannot be viewed from the portal. The module handles requests for IPs and Subnets but not for IP blocks nor IP ranges. There is no specific requirements with TeemIp standalone as TeemIp Request Management is already embedded in it. Installation on a TeemIp standalone is done with the application itself. No specific configuration is required in TeemIp's configuration file. However, 2 parameters may be adjusted in the Global IP settings, under the “Default Settings for IP Requests” block. 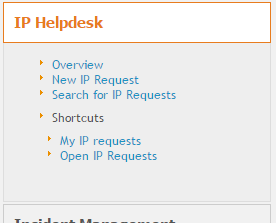 Once installed, the module will add a menu group called IP Helpdesk where IP requests will be managed from. The number of Open IP requests, grouped by organization. IP request properties shows information that is standard between all types of IP requests and information that is specific to each IP request. Attribute with mandatory flag set to Yes* may be mandatory at a given step of the life cylce only. By default, IP request management is restricted to the Hostmaster profile that is defined with TeemIp. Once selection is done, the creation form is displayed (IPv4 subnet creation, in the example below). The public and the private log are used to keep track of all communications and activities related to a user request. The public log is aimed at exchanging information with the requestor. The private log is the preferred way for keeping track of the investigations or operations: copy/paste of command line results, summary of communications with a provider, etc. Each entry in the public or private log is tracked with the name of the user who updated it and when it was done. It cannot be modified nor deleted. The public log is visible from the TeemIp customer portal. Once an IP request is created, it needs to be assigned to a team and agent before being further processed. 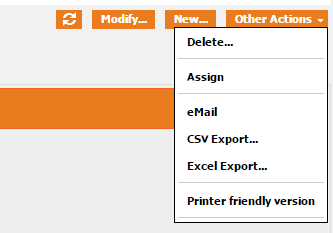 For that to happen, select the Assign action in the “Other Actions” menu available from the details page. Then select the Support team you want to assign the ticket to as well as the agent from this team. Assigning an IP request can be directly done when the ticket is created (from the Helpdesk menu but not from the TeemIp user portal, of course). Once an IP request is assigned, the agent in charge of the request can process it. This task will actually be performed by TeemIp itself which will autonomously offer the agent to choose amongst a list of IPs or subnets for new IP or a new subnet creations or to directly perform the required change for IP or subnet modification or release. When the Process action of an IPv4 or IPv6 creation is launched, TeemIp will look for the first 10 free IPs in the subnet and will list them at the top of the request. A free IP here means an IP that does not exist in the data base at all. Registered IPs with status release or unassigned are not considered as free. An offset can be used by TeemIp when doing the search for free IPs. This offset is a default parameter defined in the Global IP Settings available in the Data administration module. It is called “Offset for the creation of IPs within IPvx subnets” (with x=4 or 6). Once the IP is selected, pressing the “Process” button will create the IP in the data base with the attributes set in the request. At the same time, the ticket is put in the Resolved state. Physical / Logical Interface: the agent needs to create a physical / logical interface (that includes the newly created IP) and to attach it to the device. If the agent wants to give a specific IP address that already exists in TeemIp's data base, then he needs to press the Modify button instead of the Process one and select the right IP in the <color #ff0000>IP Address</color> field of the ticket. Once done, the ticket still needs to be processed in order to move the ticket to the Resolved state. When a direct allocation is done, the attributes given in the IP request will not overwrite the ones of the already existing IP ! Launching the Process action on an IP address update ticket will simply modify the IPattributes that have been set in the request without changing the others. Processing an IP address release request will set the IP in the released state and the Release date attribute to the current date and time. When the Process action of an v4 or v6 subnet creation is launched, TeemIp will look for the first 10 free subnets in the predefined block and will list them at the top of the request. A free subnet here means a subnet that does not exist in the data base at all. Registered subnets with status release or unassigned are not considered as free. Once the subnet is selected, pressing the “Process” button will create the subnet in the data base with the attributes set in the request. At the same time, the ticket is put in the Resolved state. If the agent wants to give a specific subnet that already exists in TeemIp's data base, then he needs to press the Modify button instead of the Process one and select the right subnet in the <color #ff0000>Subnet created</color> field of the ticket. Once done, the ticket still needs to be processed in order to move the ticket to the Resolved state. When a direct allocation is done, the attributes given in the IP request will not overwrite the ones of the already existing subnet ! Launching the Process action on a Subnet update ticket will simply modify the subnet attributes that have been set in the request without changing the others. If some complex change (like subnet resizing) has been asked through the Description field of the request, then the agent in charge of the request will need first to apply the change through the standard subnet management tools provided by TeemIp before processing the request. Note that no specific check is done within TeemIp to make sure that such action has been done prior moving the ticket to Resolved state. Processing a Subnet release request will set the subnet in the released state and the Release date attribute to the current date and time. 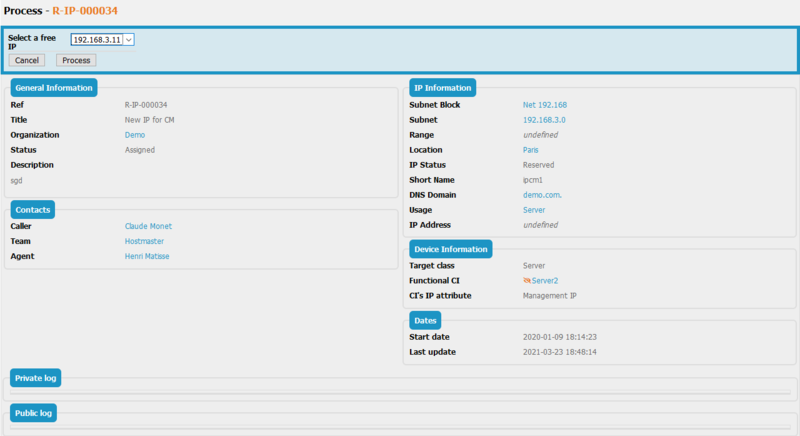 The IP Request management module can work in conjunction with TeemIp portal when used within TeemIp standalone. Please, refer to the portal documentation page for further details on it. However, the module is not integrated into iTop standard portal and therefore, IP request cannots be handled from there when installed on an iTop application.